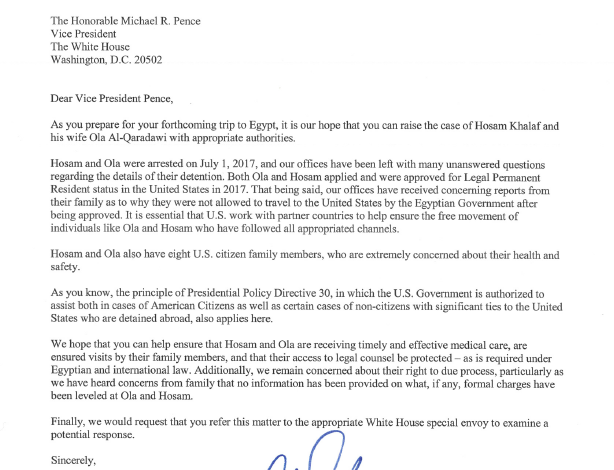 Senator Patty Murray, Members of Congress Adam Smith and Pramila Jayapal wrote a letter for to Vice President Mike Pence raising serious concerns over Ola and Hosam’s imprisonment in Egypt. Ola and Hosam are deprived of their basic human rights including the right to a fair trial and medical care. 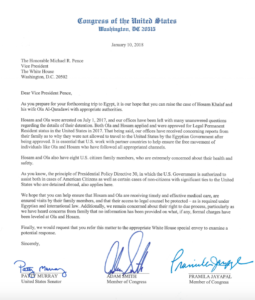 They have spent almost a year in solitary confinement in Egypt without charge or trial. Senator Patty Murray, Member of Congress Adam Smith andMember of Congress Pramila Jayapal are pushing for the White House to take action.